1- Insert 2 AA batteries (not included) into the battery compartment. When inserted correctly, the respond button will flash. We do not recommend using rechargable batteries. 2- Slide the switch to choose alarm setting: light only, alert beep, medium alarm, or loud alarm. 3- Insert the cable into the jack on the side of the alarm unit and attach the snaps at the other end of the cable to the snaps on the pad. 4- Place the pad on the bed. The wet detection area covers only about 2/3 of the pad. The alarm unit can rest on a bedside table, or by flipping out the clip on the backside of the alarm, can be clipped to a bed skirt or another location. Be sure that the alarm unit is not in a location where the cable can become wrapped around the user or can cause someone to fall. 1- To shut off the alarm, press the respond button which will cause the alarm to “snooze.” The light only, alert beep, and medium alarm settings will have a respond snooze of 15 minutes. The loud alarm has a respond snooze of 1 minute. To prevent the alarm from going off again after the respond time, unsnap the cable from the wet pad and replace with a clean, dry sensor pad. 2- Before using the wet pad again, clean and dry the pad completely (see washing instructions below). 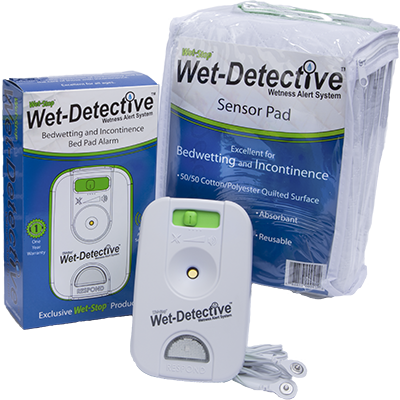 The Wet-Detective sensor pad is machine washable in warm water. Tumble dry medium. Do not iron. Do not bleach. Do not dry clean.